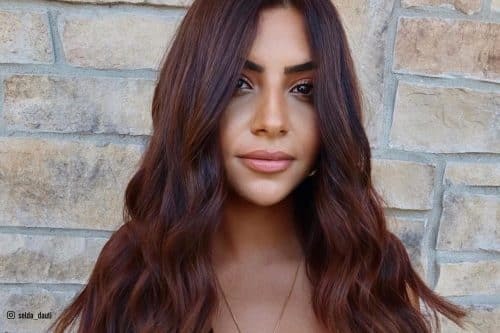 Try one of these popular honey brown hair color ideas if you’re having trouble making a decision between having light hair or dark. Are you wanting a change but nothing too drastic? Shades of honey brown might be the perfect choice for you. Honey is a warm color, but not overly warm (think soft gold rather than orange or red). It’s flattering to most skin tones, and for most, it’s only a few shades away from your natural color. Less contrast means lower maintenance – hooray! 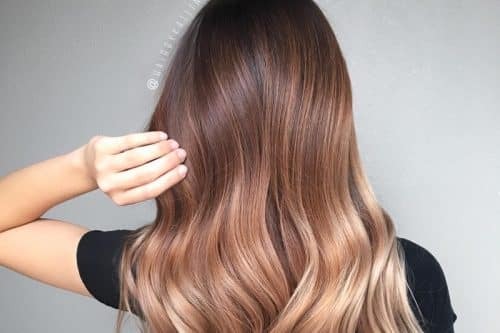 I’m sure these photos of gorgeous honey brown hair ideas will inspire your next hair color! 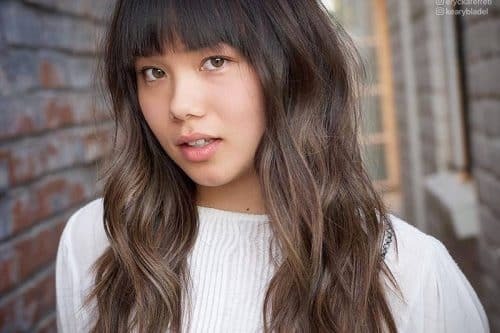 The dark brown with lighter honey brown hair highlights along the bangs are gorgeous. Pair this with a long, layered bob with a middle part for an extra modern look. Auburn, when mixed with honey brown hair, shows off its warm undertones that complement tan skins so well. This color-melt will make you an outdoor person because you’ll be wanting to show off its fiery-ness under the sun. Naturally dark to medium hair would achieve this sweet honey brown hair inspired butterscotch beautifully. A medium-length haircut is just enough to show off this smooth transition if you don’t want the upkeep that long hair needs. 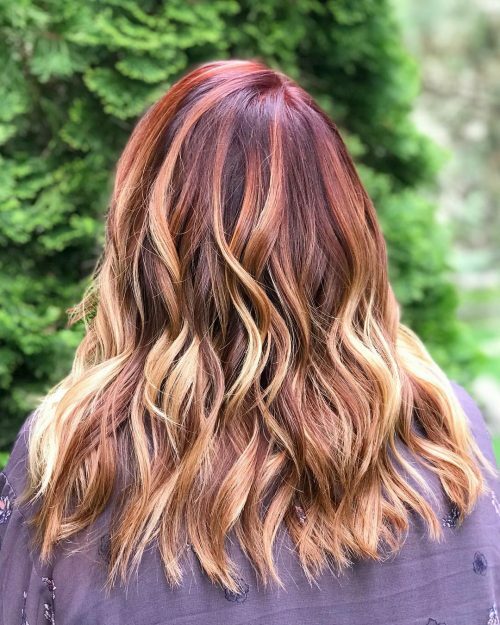 You can take your hair to the next level when you mix the right colors together especially the top three trendiest ones of all time – brown, blonde, and red. Play with the many dimensions and styling ways you can do with this hairstyle and honey brown hair. 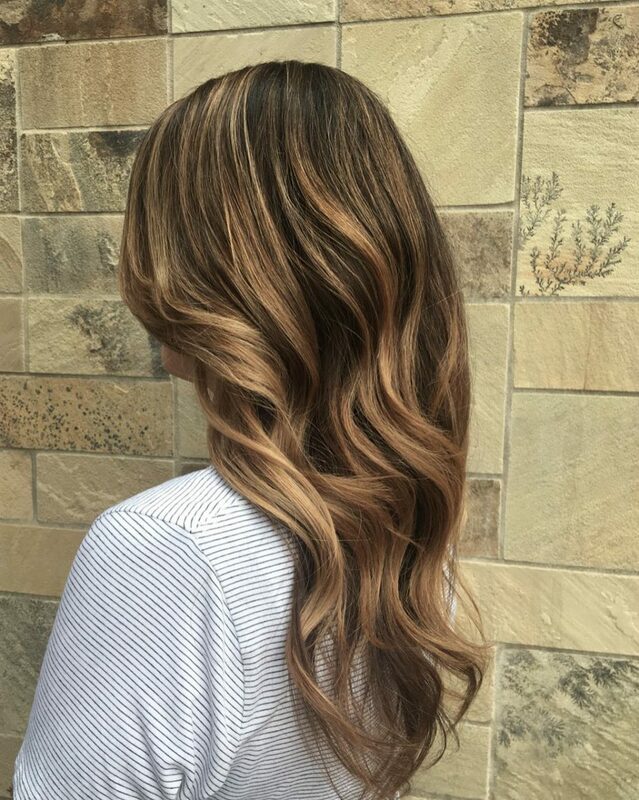 A marvelous way of getting lightened for the summer – a warm beautiful, multi-tonal honey brown hair balayage. It’s super effective if you wanna keep your long hair yet give the illusion of a light one. A subtle way to punch up your pretty brown hues is by getting honey brown streaks. Plus it gives you that effortless dimension and depth that your natural hair needs. Highlighted natural curls are super desirable when you’re craving for dimension and texture at the same time. Don’t forget to always moisturize those stunning locks, as these colors can dry your hair out if not properly taken care of. 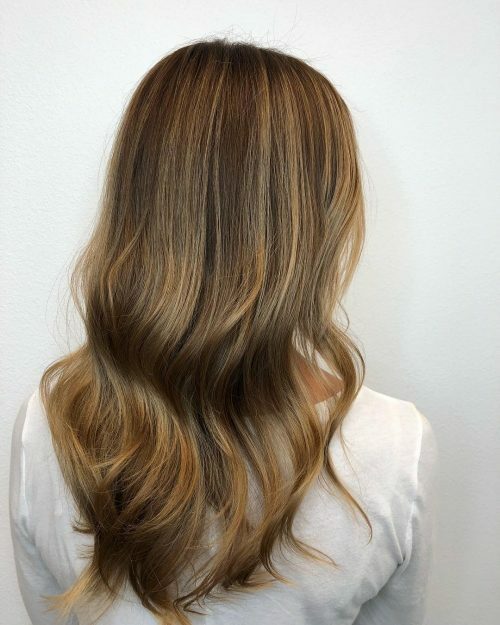 Mesmerize everyone with this natural looking hair with subtle honey brown hair highlights! It’s a proven way to make medium thin hair look dimensional and full of volume. 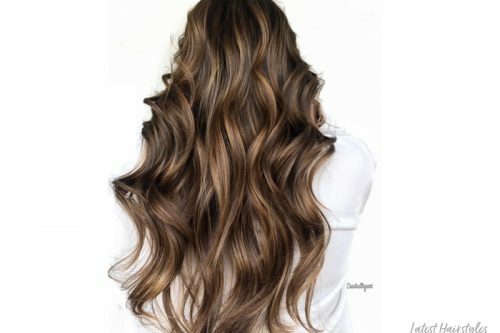 A super pretty hairstyle if you have long chocolate-colored hair! 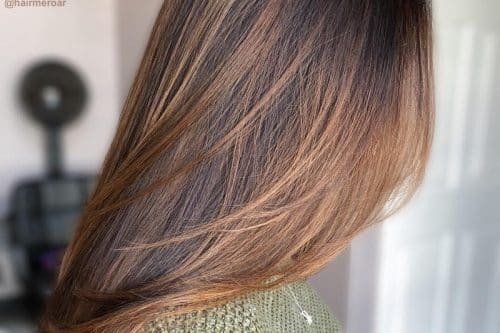 Add some waves and delicate honey brown highlights at the end to add softness and give you a more dramatic look. 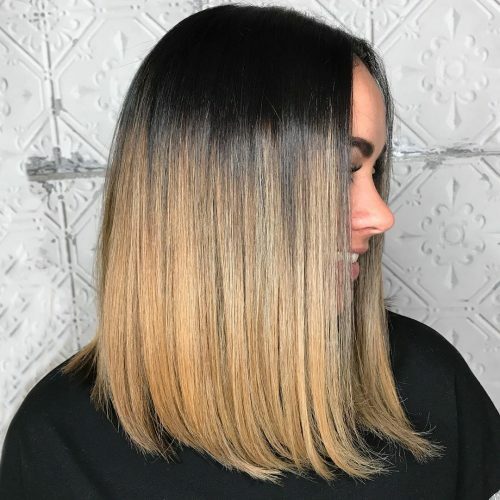 These adorable ashy honey brown hair highlights painted on straight black hair make the whole hairstyle pop out with the dimension it offers. Style it with a center part that is perfect for faces with symmetrical sides for a more interesting look. One of my favorite haircuts is a pixie. I love how versatile they can be. Her look is very natural, golden honey brown hair with natural highlights that’s great for warm, golden skin. My client has a very professional, business vibe and enjoys working out or being active with her son outdoors, so this pixie is perfect for her. 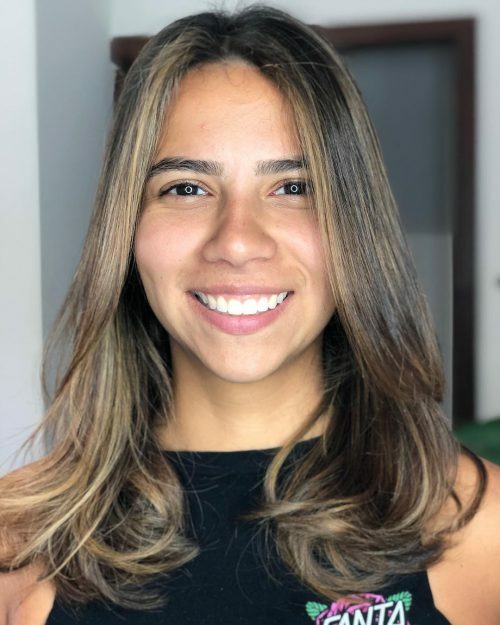 Plus she has very thick hair, so keeping the sides and nape area very short and type is good for her to stay cool in South Florida, where it’s summer pretty much all year. She can wear it to the side as shown or bring out her curl/wave texture on top and brush it back for a sleek look. 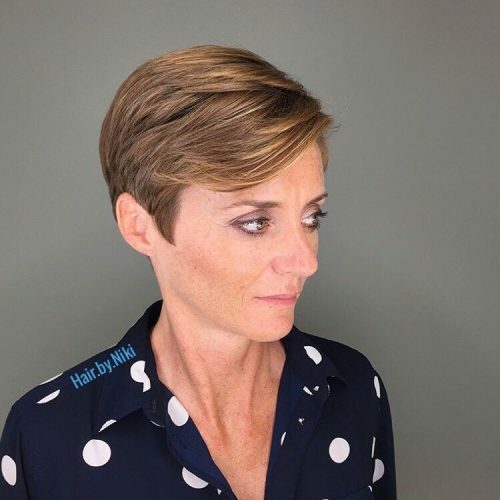 If a client sat in my chair and said they wanted this haircut, I would ask them if they ever had short hair like this before. If not, I would ask what makes them want to go so short? I would pull their hair away from their face, making a fake bang look and ask them if they like what they see and can get used to seeing this much of their face. I do this because that has changed some of my clients’ mind about going that short. You really need the personality and lifestyle for this haircut to make you feel good. 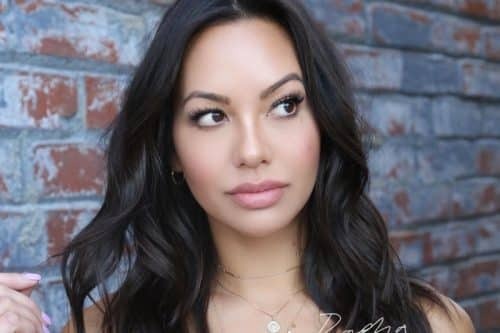 Some women feel secure with long hair around their face, so when it’s permanently gone they feel naked and insecure, even with all the compliments they get on the new look. 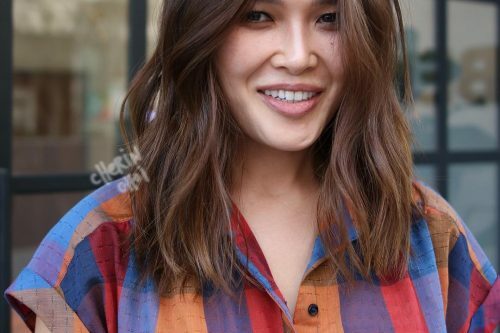 This haircut is nice for women who have strong or bubbly personalities, or women who aren’t attached to their hair. As for hair types, my client has a wavy texture but is willing to blow dry it in the mornings and apply a molding paste to hold the style. This look can be high maintenance if you don’t like how your hair air dries or if you have any cowlicks along the hairline. This is a free hand painted dimensional and textured balayage. I wanted to create movement with color placement. I hand painted the blonde and hand painted the chocolate brown next to each other to make the lightness from the blonde pop and give it a nice honey brown hair color. I knew that when the hair moved the dark would accentuate the blonde and create that beautifully textured movement. This look paired up with delicate beach waves completes the look. 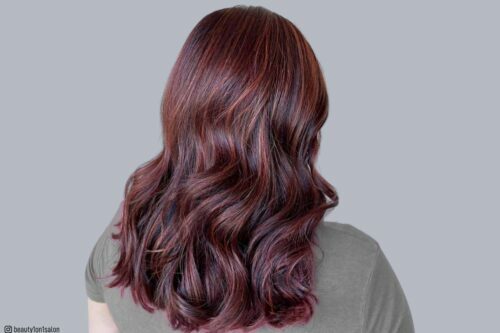 By waving the hair it helps the colors swirl together creating the dimensional color stand out from the crowds! 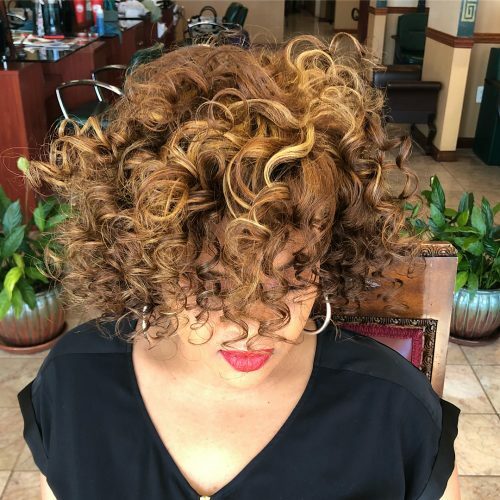 This is a versatile color that fits many types of personalities, face shapes, and hair types because it is a custom freehand hair color painted look. It is customized to enhance each individual’s hair and face shape. 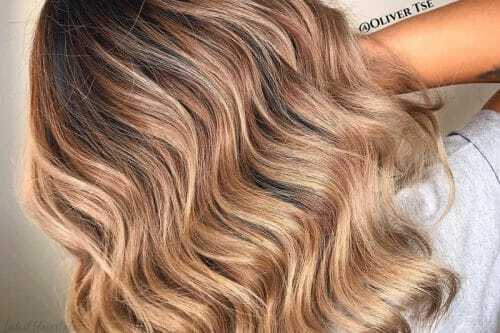 That is the reason why balayage and freehand hair painting have become very popular. It gives clients the ability to have a low maintenance blonde look. 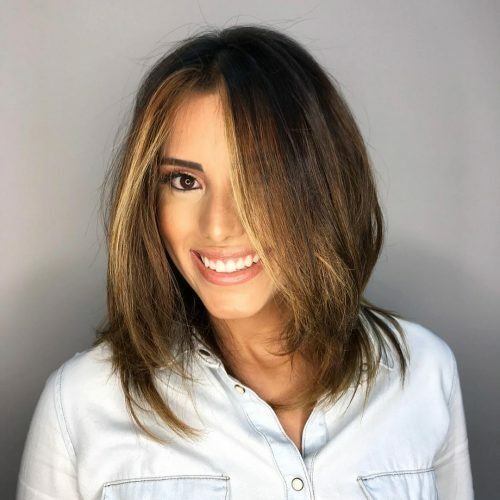 Since the roots of the hair are left on its natural tone, it gives the freedom to the client in waiting several weeks before getting a touch-up. Invest in a texturizing spray. This look is all about texture and movement. It is ideal to add such a spray to your vanity that will help create that beautifully textured look. 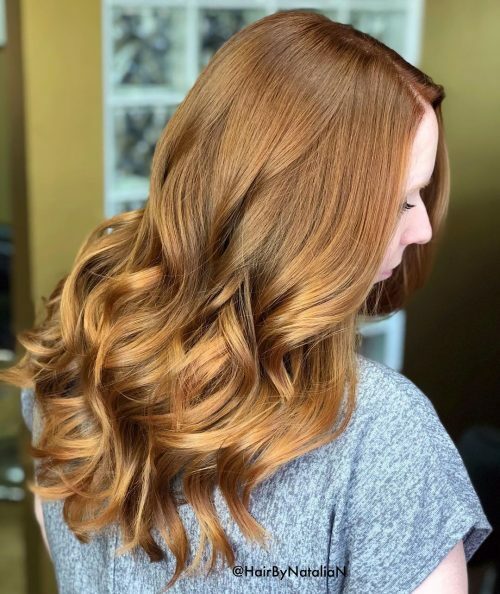 I love how this dimensional color transitions from a darker copper at the roots to a lighter copper through the ends, emphasizing the long layered cut for a soft and a natural effect. This look works with most hair types and goes well with light and clear skin that has a golden or peach undertone. It would suit a wide range of lifestyles from the businesswoman who wants to add a little brightness to her professional look, to the stay at home mom who craves a little change and excitement in her everyday routine. 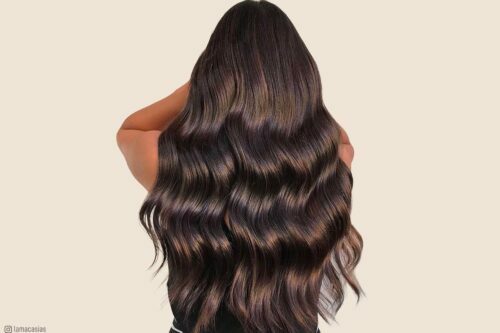 For those who consider going with this type of honey brown hair, it is important to use a shampoo that is gentle on the color treated hair and protects it against fading. I would describe this look as a rich and warm bronde balayage. What I love most about this particular look is the combination of cool and warm tones and that there is still so much dimension. 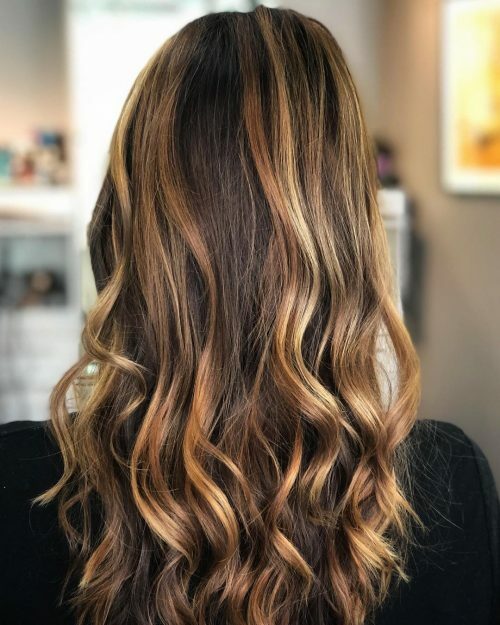 I enjoy color and balayage that still has some natural deeper tones towards the mid-length and ends. Nowadays I think that the trend has gotten a little out of control with every bit of the hairs ends being all really light and one color. The grow out on that can be harder to maintain and it’s a lot harder on the hair’s health. When I look at this I picture milk chocolate, mixed with suede and caramel to bring out a nice honey brown hair hue. For the cut and styling, I kept it simple. The cut is a traditional long layered square cut. The styling was done with a GHD curling wand. I think this cut is best for a person who doesn’t want to cut it all the time and likes her hair to be easy and effortless. This look or one with similar placement is great for a person who wants dimension in their hair. Because we have maintained some depth, the grow out is softer. This client actually only gets highlights 2-4 times a year but is in for her base color every 5 weeks. So I think it works well. This client like many others is a busy lady and doesn’t want to spend too much time on her hair during the week. 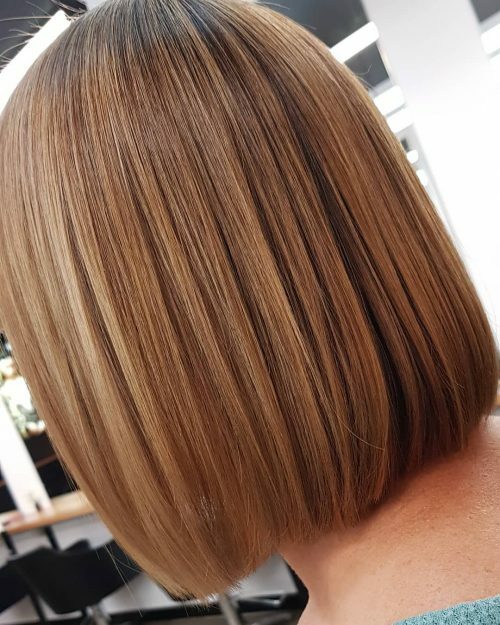 To achieve this finished look, a dry shampoo (such as Dry Me from Wella) was applied to dry hair then, subsection by subsection, a working hairspray, such as Stay Essential from Wella, is great to apply. This works on every kind of face shape. The stylist just needs to consider that placing lighter pieces next the widest parts of a face can make that area seem wider, so pay attention to where the brightness falls. This is the perfect tone for a brunette looking to go a little lighter but still want to keep it natural. 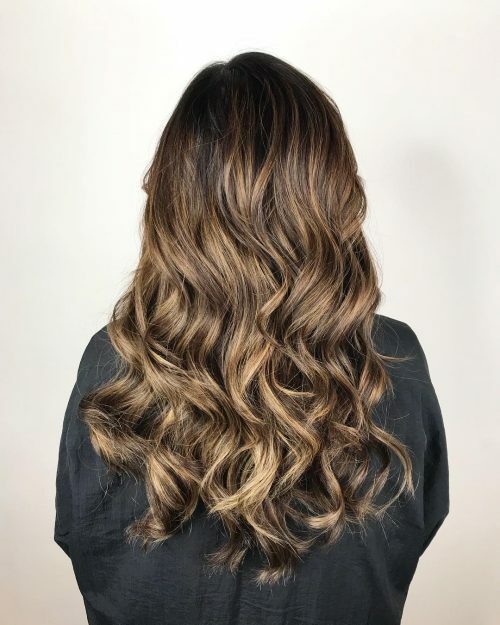 I did a full head of balayage highlights to create this look. 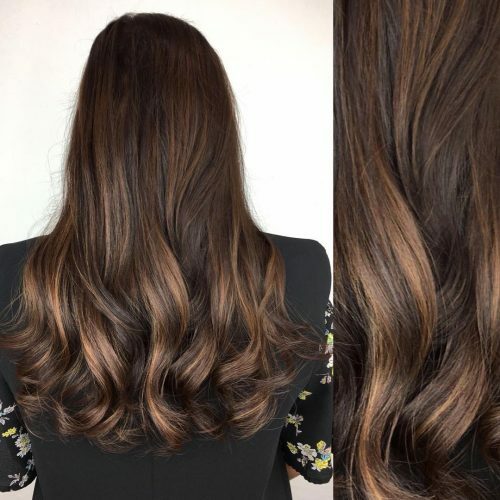 Balayage is an easy way to achieve warmer honey brown hair highlights on a darker base. Also, her grow out is so soft that we only retouch her balayage 3 times a year! We do a glaze toner a couple times in between when I see her for her haircuts. This look is about as low maintenance as it gets and budget friendly! I always urge my clients to buy professional hair care products. If you’re spending $200 on your color services, spend a little more on shampoo to maintain that beautiful color! 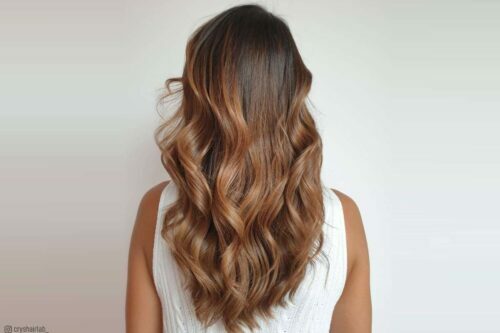 A quick blow dry and some waves with a 1-inch curling iron is the easiest way to create the effortless look! This look just makes you feel cozy looking at it. It’s neat, simple, and elegant but pops out! Who would this color suit? Nearly everyone! 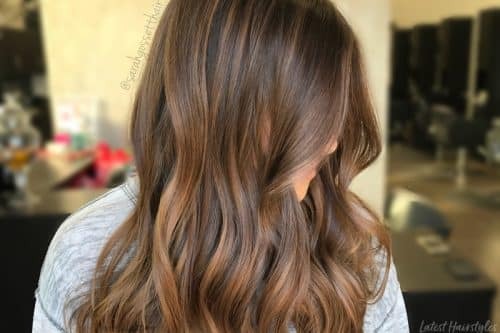 If you love a warm latte, then these honey brown hair tones are for you! As you can see in the photo, this cut and color appears so simple but has so much going on in it. There’s dimension in the tones, and the cut is bold. If you are the type of person who wants a simple low maintenance hairstyle that says a thousand words, then this would be it! It’s a low maintenance look. 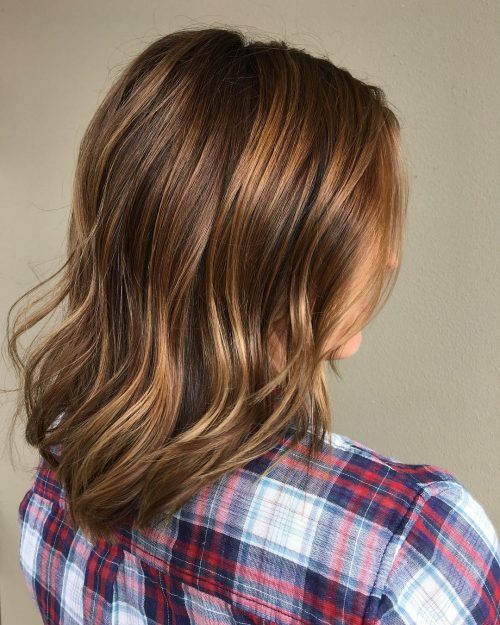 The honey brown hair and caramel tones flow so nicely with her natural base color. I softened the length of the cut with some layering and subtle face framing. This color has lots of options for hairstyles, but I personally love a soft wave. I alternate the curl pattern so the curls don’t intertwine with each other. For those who are considering this kind of color, it is low maintenance. You don’t get that harsh demarcation line, so you’ll only need a few color appointments. This is a good introduction if you are looking to go lighter, especially for brunettes. A glaze is a great in-between service to freshen up the color. Use a color safe hydrating shampoo and conditioner. Heat protection is also very important for those lightened ends. I would describe this look as honey blonde highlights on a dark brown hair. I love that that you get the elements of being blonde through highlights and balayage while still playing off of the natural color. The beauty of this look is its ability to be low maintenance which makes it work for almost anyone. My client was already coming in for base color, so when she came in wanting to lighten some pieces up without fully committing to highlights every time, this is the look we came up with. She can stay with her current base color every eight weeks, and we can add in highlights when necessary. 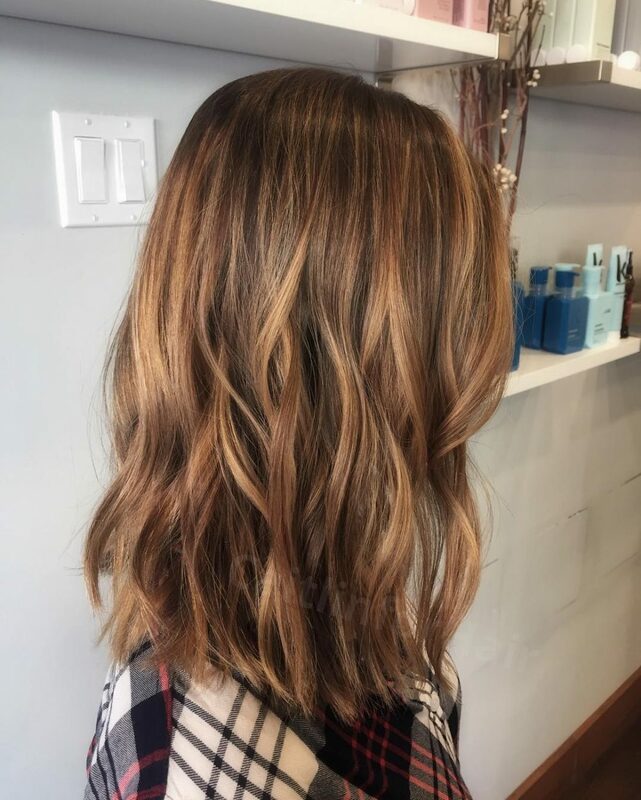 The ideal client for this look would want to keep her natural level 4-6 base color and enhance it with some highlighting. It’s important to start with strong, healthy hair that can withstand the lightening process. This look does require some TLC at home because of the lightning. You should be using salon-grade products at home to maintain the integrity of the hair. A Sulfate-free shampoo, a moisturizing conditioner, a heat protectant spray, and a nourishing oil are all staples for a look like this. Washing only two to three times per week is also crucial to maintaining the health and vibrancy. 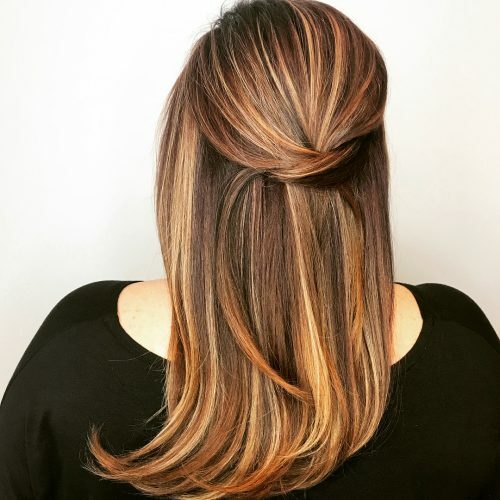 This shade of honey brown hair is perfect if you want to shake up your natural color without committing to a complete change! This look really shows off how pretty and wearable a warm blonde highlight can look coming from a medium brunette start. No need to worry about looking brassy when you use colors that work together to create an overall nice and natural-looking color. 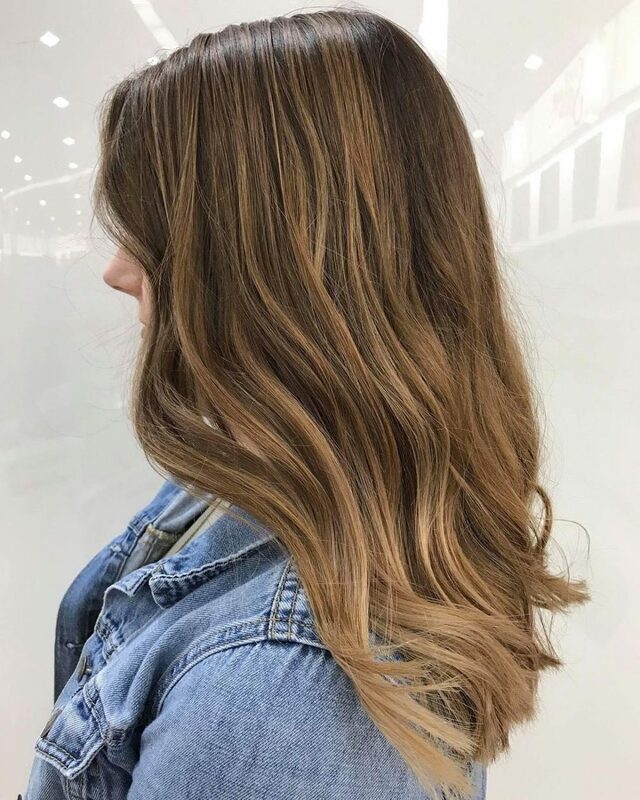 I loved using a balayage handpainting technique to create this sunkissed, natural highlighted brunette. Some advice I would give to clients wanting this look or this technique on their hair is to be open-minded. Start somewhere and have a plan, but be open to the end result. As far as products, as long as you use a good moisturizing conditioner, a color-safe shampoo, and maybe some conditioning treatments to maintain the health and shine of your hair, you should be ok. We use JBeverlyHills color and styling products at my salon and I love everything about them. This can look good with so many hair types because it’s so natural looking and the growout is really easy and low maintenance. 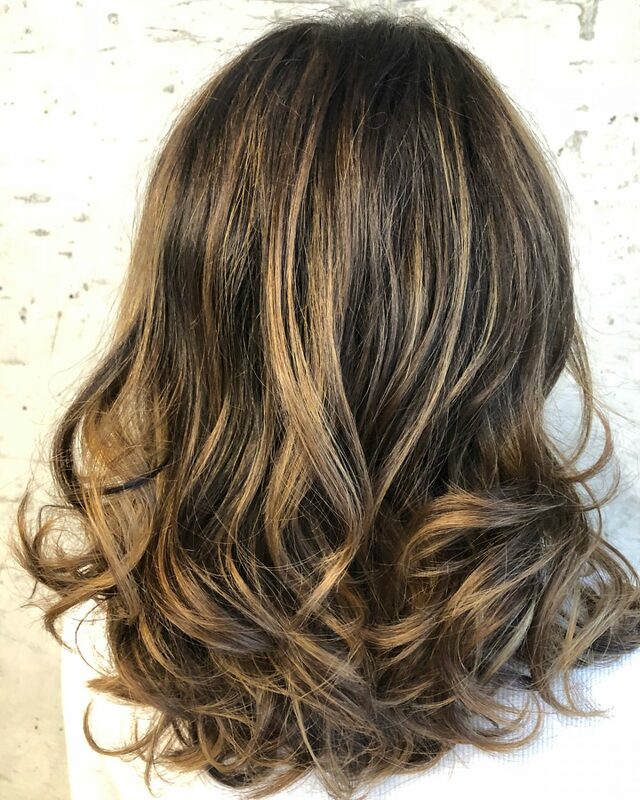 The beauty of balayage and handpainting is that you aren’t married to being in my chair every six to eight weeks, but you also have the option to if you love the brightness around your face or love changing your look more frequently. 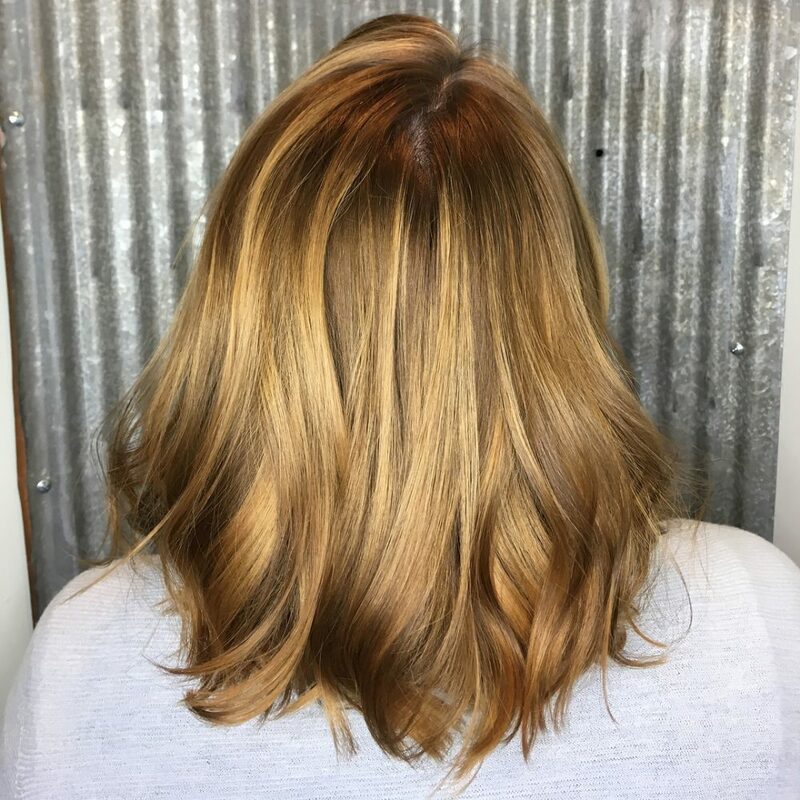 This honey brown hair is perfect for any first-time color clients looking for their first dive into the color world. This is a lob with copper/honey brown hair highlights. I love the dimension of the color and the melted effect it has from top to bottom. It’s a simple and pretty look with that “cool girl” factor. The cut is great for clients with fine hair looking to give the illusion of thickness. It is also ideal for clients that want something cool and effortless but still professional. The bottom is cut blunt and slightly a-line, while the layers are internal and texturized to create movement without giving up density. If a client wants shorter hair without sacrificing style, a lob is a great option. 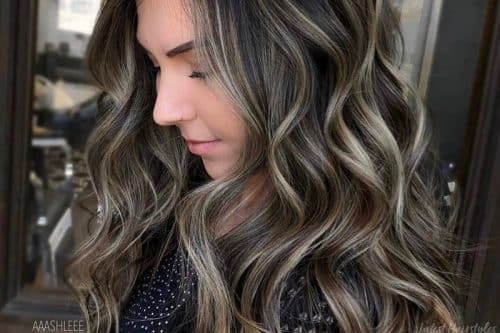 The color is a nice option for clients with medium to dark brown hair that wants the dimension that highlights give, but do not want mega blonde hair. 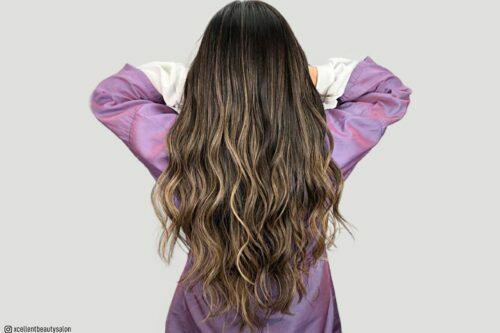 I focused on coloring the mid-lengths and ends so the client can go months and months without having to keep up with it. It’s always important to use color-safe shampoo recommended by your stylist to maintain this look. A good 1 1/2-inch curling iron gives great loose waves. I usually spray some dry shampoo in before I curl and use a spray wax to finish. This look does not turn your hair color upside down, but instead adds just enough extra color to make it a unique look. I love the natural complexion combined with the highlights. This look is perfect for anyone with naturally brown hair who wants to give it a little something special. There is not a lot of change in the hair color, but it still exudes a little bit of glamour. In my opinion, this honey brown hair dye suits anyone with a warm color type. Should these colors wash out after a while, I recommend refreshing it with a shiny tint. 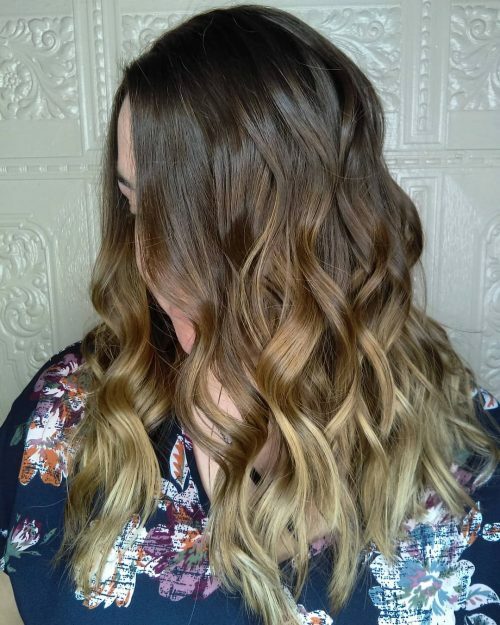 This is balayage honey brown hair that is perfect for fall and winter. My favorite thing about it is that it goes from a subtle honey to super light ends. I love the transition! The products I recommend to maintain this look would be Redken color-safe shampoo and conditioner and an at home conditioner. Use Wax Blast hairspray for texture if you want to curl and a heat protectant if you want to straighten. I will recommend balayage to people who want little upkeep. Anyone can wear this because it can be a subtle service and transition. This particular color looks best on a pink skin tone. She needed warmth in her hair to brighten up her face so it didn’t wash her out. A lot of teenagers want this look just because they don’t want to always have their hair colored. I recommend coming in at least six to eight weeks after the service for a glaze because it is a semi-permanent color.